Have you heard of a new segment CUV ? Ford has a answer for that. Christened as Compact Utility Vehicle (CUV), Ford recently launched the Freestyle in India which is essentially the rugged, cross-hatch version of the Figo. But I’m not going to get into the details of the Freestyle here. I am going to share my drive experience at the CBC Ford Fest . 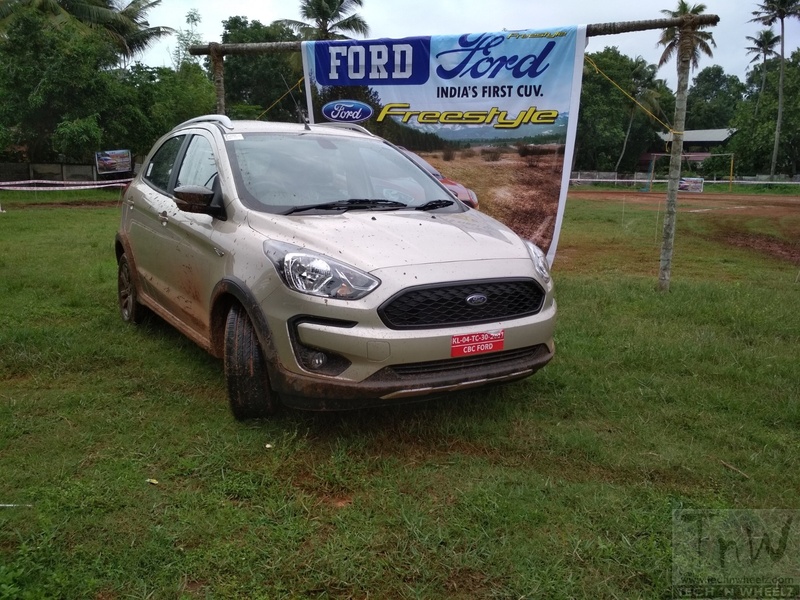 The event was organised in Mavelikkara, Kerala by India’s one of the youngest off-road racer Athira Murali in association with CBC Ford Thumpoly, Alappuzha . It was an honour to be a part of this event and was one of the best platform to explore the Freestyle’s off-road capability. The 2-day event, 24th – 25th May, 2018, saw participation of potential customers and enthusiasts experience the Ford Freestyle. The adventure track was customised to showcase the vehicle’s capabilities. The rains in Kerala added its flavour to the off-road experience to some extent. The ground clearance was displayed through high humps across the track manoeuvrability was highlighted through a serpentine course and angled ditches to experience the smooth suspension of the vehicle. Also on the track were slush pits & cambered angles for proving the capabilities of the Freestyle. Athira & team claims that such type of event is the first in the region for a car of this category. “Through this initiative, we aim to bring the thrill of off-roading within reach of enthusiasts. The track was designed keeping in mind both for hatchback upgraders and customers using soft-offroaders“, says Athira. Athira Murali, has the unique distinction of being India’s one of the youngest upcoming woman off-road racer. She was also honoured in the India Book of Records and Universal Record Forum for being the youngest person to hold the most number of vehicle licenses. The Freestyle is available in four trims – Ambiente, Trend, Titanium, and Titanium+ – with the option of a petrol and a diesel engine. Prices range between Rs 5.09 lakh and Rs 6.94 lakh for the petrol and Rs 6.09 to 7.89 lakh for the diesel. The petrol engine is the new 1.2-litre three-cylinder Dragon unit that churns out 96hp and 120Nm of peak torque, making it the most powerful petrol in its segment. The diesel Freestyle carries forward Ford’s tried-and-tested 1.5-litre, four-cylinder TDCi engine that produces 100hp and 215Nm of peak torque. Both engines are mated to a new Getrag-sourced five-speed manual gearbox, which is more refined and lighter than the unit it replaces. In turn, it also uses 40 percent less gear oil. Based on the Figo hatch, the Freestyle has its ride height increased by 16mm to 190mm (unladen) and gets larger 15-inch alloys. It also comes with the expected off-road bits like body cladding, skid plates and functional roof rails. Mahindra Mojo UT 300 launched. Its carburetted ! !